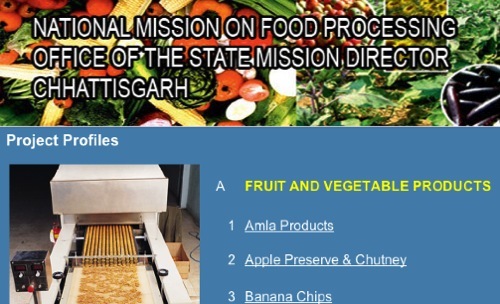 The National Mission on Food Processing is an Indian web site that provides very detailed information for food processing entrepreneurs on a wide range of food products. The site provides wide ranging information including product and process descriptions as well as costing and financial analysis. It is focused on the needs of smaller and start up entrepreneurs, although the information would be valuable to any processor. Some 110 product are covered in this manual. Unfortunately, the information and especially the suppliers and costing is developed for application in India. However, it is still a useful source of information for any entrepreneur. This entry was posted in ..Agribusiness/tech, .Agribusiness, Enterprises, Equipment, Food Processing Information, Free Online, Market /Business, New Category, Product Design, Technology and tagged entrepreneurs, equipment suppliers, Food Processing, process, Technology on September 8, 2013 by admin. DIGIVU Offers Free Technology Information Searches. I have for many years been closely involved in extracting free technology information from the INTERNET. I believe I have developed a real skill at this and want to offer to do free searches for all the users of digivu.co.za. Either leave a comment or email me – unless you request otherwise, I will publish the result as it will surely interest others. 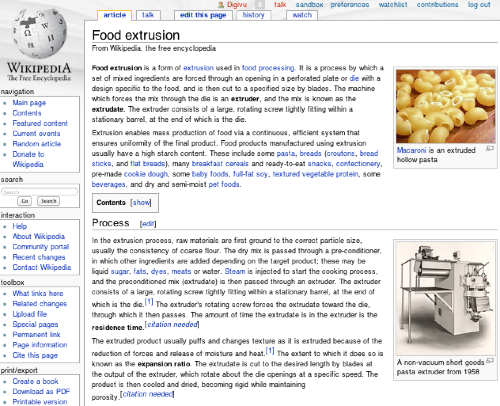 Note that for more complex technology information and evaluation you could use the Food Industries Information service. The interesting thing about Wikipedia is that it seems to be as reliable as any other encyclopedia. A study by Nature of Wikipedia and Britanica found that there were only 8 serious errors in the entries evaluated. Four of these from Wikipedia and four from Encyclopedia Britannica. They also found that while Wikipedia articles had 162 less serious errors Britannica had 123. These results were disputed and the measuring of the reliability of Wikipedia information is ongoing, but seems to indicate Wikipedia is a legitimate source of information. In any field such there are always a number of websites that are recognized as suppliers of information e.g. FAO, Practical Action, Unido, CTA, GTZ for smaller scale food processing. Sometimes for a specialised technology these are not as useful and more attention needs to be paid to other sources. In this case only Practical Action, amongst the above sources, seems to have any information at all. However, these sources are often sufficient to provide whatever is required. Using a knowledge of how to search and your understanding of the industry you are searching, allows you to find all types of useful information. For example searching for pdf documents only, gets you into areas where your chance of finding something useful is larger – for instance academic reports. 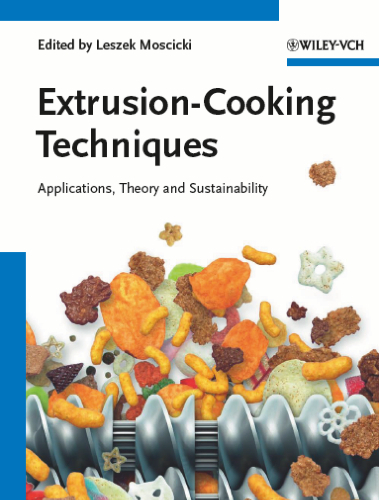 As an example this one presents 30 pages of pretty broad and clear introductory information on extrusion. Universities, government departments and associations are often good sources. 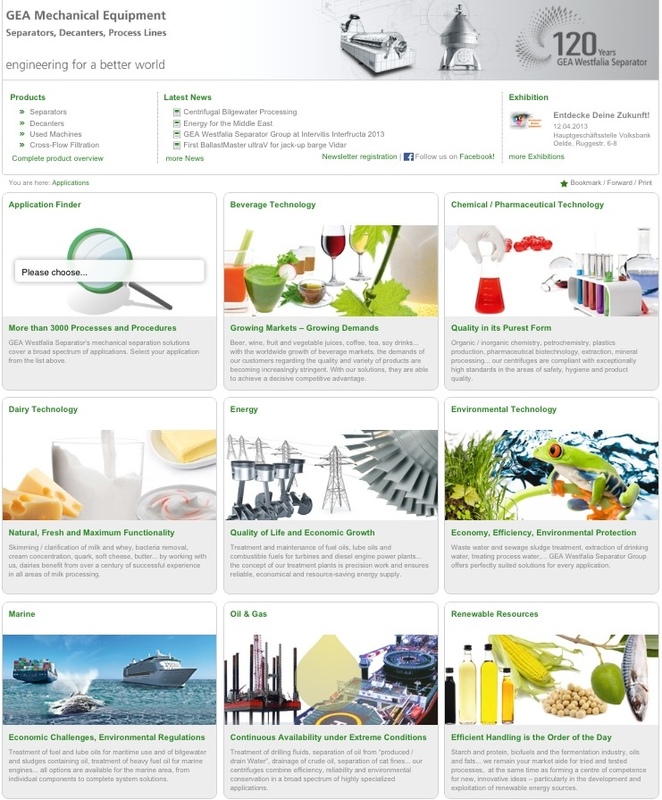 Never forget that the equipment suppliers have excellent information on food processing technology and business. They are often prepared to share it openly in an effort to attract customers. 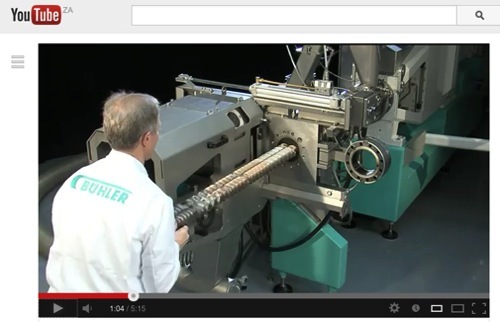 As an example (and not a recommendation) Clextral offers some useful information on extrusion. This type of information needs to be used with caution because its actually advertising and needs to be evaluated like any advertising. Search Engines make searching too easy! Whatever word/s you enter are going to yield many results, possibly too many! Which is likely to make you worry about finding the useful information in amongst all that is generated by the search. Alternately you may miss information if your search is not accurate. Take time to learn how the search engine works and learn the features that make your search more effect and efficient – things like searching by time, searching particular web domains, searching via images, excluding results, literal searches, boolean mechanisms etc. Avoid the temptation to print and file the information you collect. Use read it later services, downloading, databases, structured storage and purpose designed software like Apple’s iBooks to sort everything you find. Then use searches to find the information when you need it. The above information has all been legitimately posted on the internet. It is also possible to source information illegally, much like pirating music, which I do not recommend. Often a legitimate search with identify information posted on a legitimate website which seems rather suspect, which the user could legitimately used assuming that the site had made sure this information could be shared legally. For example, although the book above shows up on a GOOGLE search and is downloadable from a legitimate university website, I suspect downloading and using it would be breaking the copyright. As to reading it online, I am just not sure, although this is the equivalent of reading the book in the university library. This entry was posted in ..Agribusiness/tech, Food Processing Information, Free Online, Information, Links, New Category, Technology and tagged Food Processing, free, online information, searching, Technology on August 20, 2013 by admin. 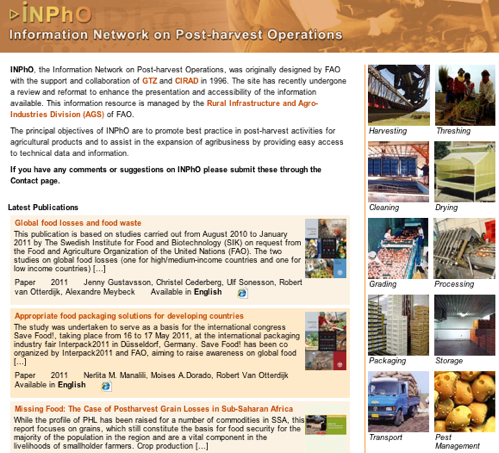 The International Network on Post-harvest Operations – Information Sources. The INPhO network of the Food and Agricultural Organisation is one of the more comprehensive sources of processing information for small enterprises. The information is comprehensive and has a commodity as well as an equipment focus. The equipment and individual databases of the past seem to have been removed, but compendiums and toolkits seem to supply useful information. These however seem to require a bit of digging to find. There is also some business information although this seems to only include the Agriventure programme developed some years ago. I must admit to being a bit out of touch with this information, so would ask anyone who has recommendations on how to optimize its value, to leave them in the comments. This entry was posted in ..Agribusiness/tech, .Agribusiness, .Food Processing, Development, Equipment, Food Processing Information, Technology and tagged compendiums, fao, food processing Industry, INPho, toolkits on August 1, 2013 by admin. 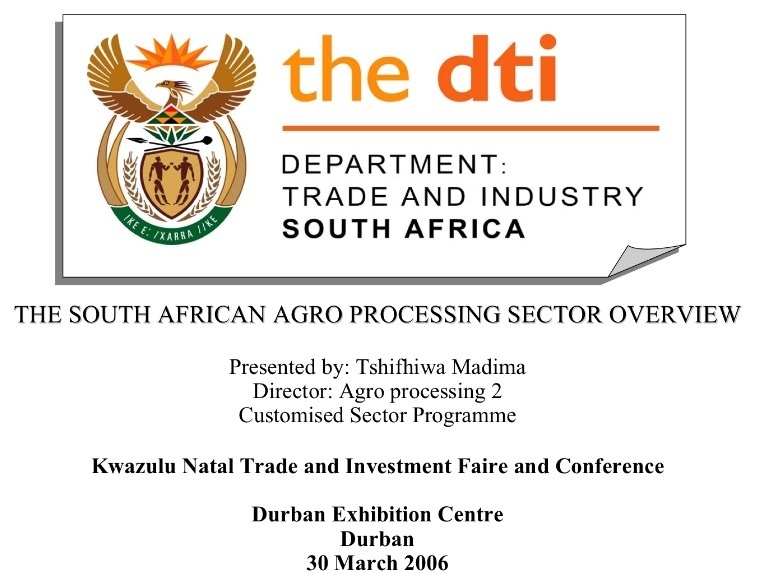 This presentation by the DTI contains interesting information on Food Processing and the Food Processing Industry in South Africa. Although it is rather old, much of the information is still of value. This entry was posted in ..Agribusiness/tech, Enterprises, Equipment, Food Processing, Food Processing Information, Market /Business and tagged food processing Industry, South Africa on June 28, 2013 by admin. GEA is an enormous processing equipment group that includes previous independent processors such as Westfalia, Wiegand, APV Kestner and Niro from the days when I still worked in processing. 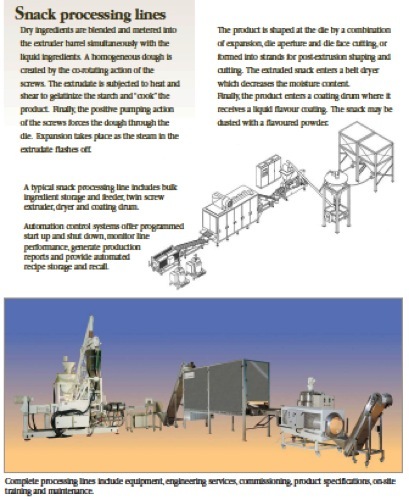 This website is that of the separator, decanter and process line part of their business. It presents a wealth of general information on many beverage and dairy processes with links to their equipment pamphlets. Each process is described in detail with a process flowsheet. While you might be tempted to dismiss this as a source of information because of it equipment supplier link, I believe the information is general enough and unbiased to be useful. This entry was posted in ..Agribusiness/tech, .Food Processing, Equipment, Food Processing, Food Processing Information, Technology and tagged cheeses, dairy, decanter, fruit juice, fruit processing, juice, milk, separator, vegetable on April 12, 2013 by admin. 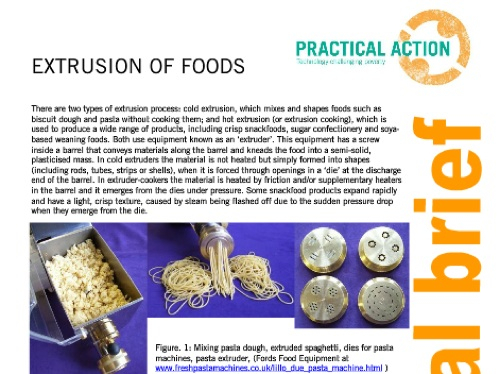 This free 12 page documents by Brenntag focusses on the use of preservatives in the preservation of food and beverages. This is admittedly a manufacturers document, but it gives good very short overviews of micro organisms, hurdle technology, pH, Water Activity, preservatives and acidulants before detailed information on the application of preservatives in different food groups. This entry was posted in ..Agribusiness/tech, .Food Processing, Food Processing, Food Processing Information, Technology and tagged acidulants, preservation, preservative on November 26, 2012 by admin. I have posted previously about the “New” Food Chain, which is the successor to the original food chain magazine which was originally published and widely distributed for free by ITDG, (later Practical Action). The original magazine is replaced by a new International Peer Reviewed Journal as explained here by Practical action. Food Chain is now about to publish its 4th issue and is disseminating interesting smaller scale food enterprise information within its Food Value Chain focus. To allow you to get an idea of what the journal offers, the first edition is now free for download. The first edition published the following articles, which can be accessed by clicking on the image above. If you are interested you can subscribe, buy individual articles online or use the free online abstracts. 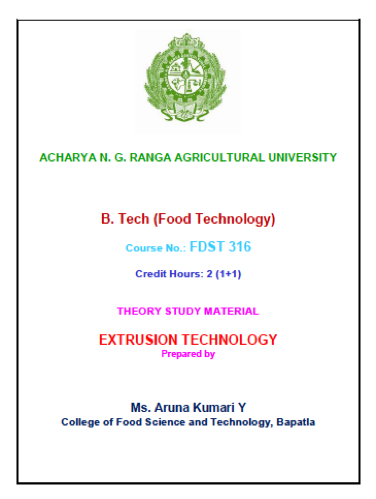 This entry was posted in ..Agribusiness/tech, .Food Processing, Food Processing, Food Processing Information, Food Products, Technology and tagged food chain, journal, Practical Action on November 21, 2012 by admin. This manual prepared by the Grocery Manufacturers Association is available online for free download. This 150 page book is very detailed and focusses almost exclusively on safety. This entry was posted in ..Agribusiness/tech, Food Processing Information, Technology and tagged GMA, manual, nuts, safety on August 23, 2012 by admin.